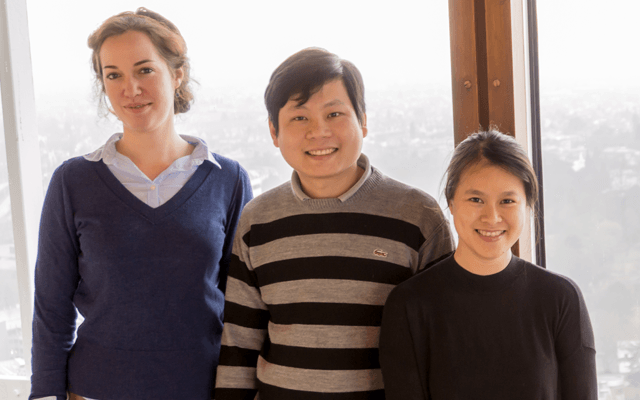 Ms. Pham Thi Thanh Hoai, Ms. Gianna Braun and Mr. Minh Tu Nguyen are PhD students at UNU-EHS, conducting research within the DeltAdapt Project with a focus on adaptation to environmental change in the Vietnamese Red River Delta and Mekong Delta. We asked them about their background, ideas for their PhDs and future plans. Where are you from and what brought you to UNU-EHS? Ms. Pham: I am from the center of Vietnam, a province called Quang Tri, I grew up in the main town of this province, now it is actually a city. I did my Bachelors at the diplomatic academy of Vietnam in Hanoi. I completed my B.A. degree in international relations and then stayed in Hanoi for three more years during which I worked for Save the Children and Oxfam. I then decided to pursue a Master’s degree in Globalization and Development and with a scholarship from the Belgian government at the University of Antwerp in Belgium. Immediately afterwards, I completed a second Master in international economic studies at the Université Paris-Est Créteil – Val de Marne in Paris. I stayed in Europe after my two masters to complete an internship with a Belgian NGO and then I was offered the PhD position at UNU-EHS. Ms. Braun: I am from Germany and came to Bonn to study. I studied agricultural science with a focus on plant production and a special interest in soil science. It was during the final phase of my Masters that I heard about the PhD program at UNU and I applied for it. The PhD position was very attractive because I liked the interdisciplinary approach that not only considered the problem from the analytical and soil science perspectives but also consider the social perspective. Mr. Nguyen: I grew up in Vinh Long, a province in the South of Vietnam and went to school there. I did my Bachelor’s degree at Can Tho University with a major in fisheries management. I focused on growing fish and shrimp and at the same time managed the natural aquatic resources. After my B.A., I started working for the government in my home town as an agricultural advisor for the famers in the region. Then, I was awarded a scholarship from the Vietnamese government to study abroad and I successfully applied for a Master’s in agricultural science in the tropic and sub-tropics at the University of Hohenheim in Stuttgart, Germany. But before making the big move, I moved to Hanoi as I received a scholarship from the German Academic Exchange Service (DAAD) to study German. When I was still writing my Master thesis in Stuttgart, I found out about the PhD opportunity at UNU-EHS and I ended up moving to Bonn for it. What is the topic of your PhD? Ms. Braun: My PhD research work is carried out within the DeltAdapt project. My focus in this study is to explore and assess the impact of saline intrusion on agrichemical use and fate by considering both the direct impacts of salinity levels on pesticide and antibiotic fate as well as the indirect impacts via different land use along salinity gradients in the Mekong Delta and via adaption strategies in the Red River Delta. I got interested in the delta regions in Vietnam after I got the PhD program at UNU-EHS. In fact, my first visit to Asia was in the course of my PhD. Mr. Nguyen: In my PhD I explore why farmers in the Mekong and Red River Deltas change their farming practices. I analyze whether these changes are positive in the long run and how agricultural systems in these deltas will change in the future. For my PhD, I conducted focus group discussions and interviews with both local farmers and authorities working on these topics. I have already found out that there are many reasons motivating farmers to change their farming practices. Initially, I assumed it was mainly because of salinity intrusion, but there are many other social-political reasons such as policy intervention, or higher revenues for farming, for example shrimp instead of rice. The two deltas are quite different in biophysical and social contexts, so the changes in agricultural systems and reasons for these changes are very diverse. I am keen on seeing the final results of my research and hope that the findings will help us to better understand the agricultural changes in the deltas and inform new ways in which we manage them. Ms. Pham: I am studying households’ decision making processes and livelihood dynamics in response to the development of the deltas regions. The deltas are not only affected by environmental changes but also economic and social transition, in fact the whole country is developing drastically. There are major environmental changes in these coastal areas, but farmers do not only respond to those. There are, for example, a lot of industrial zones which create new off-farm jobs that might create better income opportunities. At the same time farmers need fewer laborers on their fields. This phenomenon is only one of many variables explaining the fact that farmers’ livelihoods are being shifted and labor mobility is increasing. I conducted a household survey with 800 households in both major delta regions of Vietnam for my PhD. I am so excited about this research, since the research context is very complex and dynamic. Approaching this at the household level will help us understand the regions better and make projections about future development trends. Mr. Nguyen: After my PhD I want to go back to Vietnam and work for my government. My father worked for the government and so did my brother, I would like to follow their footsteps and continue my previous job. My dream job would be to work as lecturer for the university in my home town. As a lecturer I could continue my research in the delta area but also teach. I would always prefer to work in this region. Ms. Pham: My dream job is doing research on the environment in general. The Mekong Delta is a hotspot for many researchers and very dynamic, if I can stay focused on this area it would be ideal. I will follow my job more than a destination, so I am open to moving anywhere if there is an interesting opportunity. Ms. Braun: Finishing the PhD!